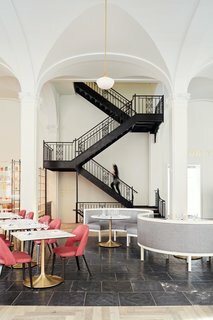 Located in the heart of Richmond’s Downtown Arts District, Quirk Hotel is an ideal home base if you are looking to take in the contemporary arts scene. On the main drag where the city’s First Fridays art walk takes place, the chic boutique hotel also is a stone’s throw from tasty restaurants (merely walk across the street to Comfort). With an in-house art gallery, funky gift shop and rooftop bar, you may want to just hang around for a while though.